Over the past several months we have been posting articles on families involved in a drum corps. Some families have over one hundred plus years. Some not as many. One similarity in all of these articles, is that they have been doing it as a family. Such is the case of the Ripley family of the White Sabers. 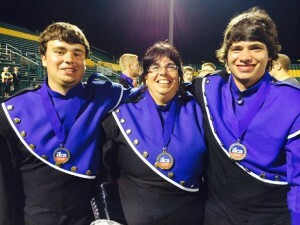 Mother, Jill Ripley first joined the White Sabers in the fall of 2005 without having ever marched in a drum corps. She had the opportunity to attend a Blue Stars camp after graduating from high school but things did not work out. So Jill came to the White Sabers and played soprano. Many family members had marched in high school bands but never in a drum corps. When her sons, Jordan and Josh, were able to join the field band at their school.Jill attended several of their practices. Another parent Jill met there happened to be in the White Sabers with his boys. She mentioned how she missed her high school band marching days and wished she could do it again. They attended a White Sabers camp to check it out and the rest is history. Jill cannot describe how awesome it is to able to march with her sons. She stated that ” There is always that different special bond that was created by being in drum corps together “. She takes pride in having son Josh serve as a front ensemble tech in which Jill now is a member. A foot problem caused Jill to learn how to play the vibraphone as she had to give up the marching drill. DCA has benefited the Ripley family by providing so many learning opportunities and exposing them to such great teachers like Donnie Allen, Robert Zazzara, and Ben Chaffee. Drum corps has taught her boys to appreciate diversity and learn how to get along with people that may have differing points of view. As she has gotten older, ( She carries an AARP card ) Jill has thought several times about packing it in. But as she said ” when you add in the element of competition while striving for that perfect performance as a team, that when you kill it you know it”. The corps main fundraiser is a weekly bingo at which Jill has become a regular helper. When not doing drum corps Jill likes reading going to festivals or going to WGI winter percussion shows as Jordan and Josh marched with United Percussion. Jordan has since aged out but Josh will be returning this year. Jordan Ripley joined the corps in early 2006 as a baritone player and has since been exclusively in the drum line. Over the years he has played bass drum for three years, two years on tenor drum, and five years with the snare line. Jordan did not consciously choose DCA, but because at the time he decided to join there were several corps based out of New York State so it was a pretty logical choice for him. DCA has given him something he can relate to plus it keeps him busy and out of trouble. Dealing with emotional disorders as kids, drum corps has helped both boys out as the disciplined weekly practices keep their attention span focused. As Jordan stated ” I honestly don’t think I would be the same person without drum corps ” . Marching with his family has been super rewarding to him, especially after the corps won the Class A title a few years ago. Jordan does the drum corps activity because he loves to play music, but lately it is because of all cool people he meets year after year. When not doing drum corps, he instructs at a few high school bands in the area and works as a Network Administrator. Josh Ripley joined the corps in 2007 at age eleven! He helped with moving equipment and at the souvenir table at the shows. Since then he has been a member of the front ensemble starting on glockenspiel, then xylophone, and then center marimba every year right up to this past season when he became an instructor. Josh originally did not choose DCA as his love for playing video games all weekend was his main priority. Mom won out as she wanted him to do something more than video games and Josh realized that the more he did drum corps the more he liked it. DCA has benefited Josh as he has all the extra time to spend with his family, but at the same time drum corps can be a little strange. This season Josh was the front ensemble instructor for the corps. And who was one of his students? That’s right folks it was Mom! Josh does drum corps because he feels it is it’s own sort of family. It’s the kind of activity where everyone has to work really close together, and everyone’s actions and efforts can affect everyone else pretty heavily in a good and positive way. When not doing drum corps Josh enjoys video games, helping teach marching band at Corning/Painted Post high school with his brother, and marching with WGI percussion unit United Percussion. The Ripley family is another prime example of a family involved in a drum corps and how our activity has made this family bond a stronger one. As Corps Director Pete Amico stated ” This family is willing to do what ever needs to be done”.